Donald Trump had some advice for George Washington. During a guided tour of Mount Vernon last April with French president Emmanuel Macron, Trump learned Washington was one of the major real-estate speculators of his era. So, he couldn’t understand why America’s first president didn’t name his historic Virginia compound (or any of the other property he acquired) after himself. The VIPs’ tour guide for the evening, Mount Vernon president and CEO Doug Bradburn, told Trump Washington did, after all, succeed in getting the nation’s capital named after him. Good point, Trump said with a laugh. America’s 45th president is open about the fact he doesn’t read much history, or much at all for that matter. In July 2016, Trump said he never read a presidential biography and had no plans to do so. Though he is an avid fan of George Patton, the flashy, tough-talking World War II general, he has shown less interest in learning about his presidential predecessors or about the office he now occupies. Former White House aides say Trump initially did not know the history of the Resolute Desk, used by presidents since Rutherford B. Hayes, though he now enjoys showing it off to visitors to the Oval Office. 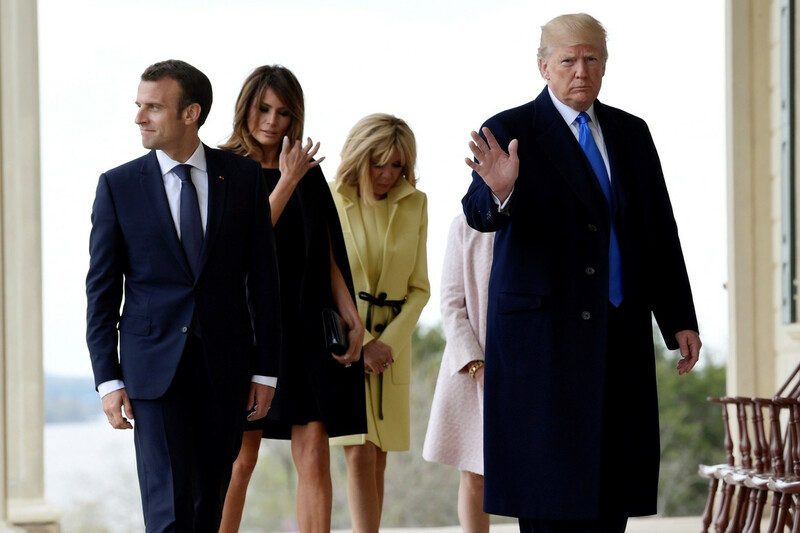 Trump’s disinterest in Washington made it tough for tour guide Bradburn to sustain his interest during a deluxe 45-minute tour of the property, which he later described to associates as “truly bizarre.” The Macrons, Bradburn told several people, are far more knowledgeable about the history of the property than the Trumps. A former history professor, Bradburn “desperately tried to get Trump interested in” Washington’s house, said a source familiar with the visit, so he spoke in terms Trump understands best. He told Trump Washington was an 18th century real-estate titan who acquired property throughout Virginia, and what would come to be known later as Washington, D.C.
Trump asked whether Washington was “really rich,” according to a second person familiar with the visit. In fact, Washington was either the wealthiest or among the wealthiest Americans of his time, thanks largely to his mini-real estate empire. If Trump was impressed with Washington’s real estate instincts, he was less taken by Mount Vernon itself, which the first president personally expanded from a modest one-and-a-half story home into an 11,000 square foot mansion. “Mount Vernon has a policy of not providing details about high profile visits outside of the official statements provided by the organization,” a spokesperson for Mount Vernon told POLITICO before this story was published. After its publication, the Mount Vernon Ladies’ Association released a statement saying, in part, that “third-party accounts of the Trump-Macron visit released by several media outlets today do not correctly reflect the events that transpired nearly a year ago.” The statement added: “Comments pulled from sources who were not present for the tour do not properly convey the tone and context in which they were delivered. Many Americans don’t fare much better than the president when it comes to a knowledge of the basic facts of American history — and one person close to the White House said Trump’s supporters aren’t bothered by the fact he isn’t a history buff. “His supporters don’t care, and if anything they enjoy the fact that the liberal snobs are upset” that he doesn’t know much history, this person said. But most Americans do not become president of the United States. After their tour of Washington’s mansion, the Trumps and the Macrons dined in the house’s New Room, an experience rarely afforded even to the most exclusive visitors to the property, according to sources familiar with the site’s operations. The previous year, the Macrons hosted the Trumps for dinner in the Eiffel Tower, and the evening at Mount Vernon was meant to be a corresponding gesture. “Honoring George Washington’s life requires us to remember the many challenges that he overcame, and the fact American history would have turned out very differently without his steady leadership,” Bush said. “A good bed to die in,” Trump said. March 4, 1797, George Washington did something that put him on a historic pedestal above Julius Caesar, Napoleon Bonaparte, and every past conqueror and crowned head of Europe: He gave up power. This wasn’t expected of him; most Americans hoped he would remain president, for life, if possible. He chose instead to return to his farm at Mount Vernon. He yearned for home but also to establish enduring precedents for the nation whose independence he helped painfully win: No man is bigger than the country. The office is more important than any president. Power is a privilege to be wielded and then handed to another. There are ironies on top of ironies in the father of Trump Tower offering posthumous advice to the father of our country. But the greatest of them is 220 years after George Washington’s death, his name is everywhere and remembered by everyone, largely because he chose not to maximize his own opportunities for self-promotion. With his offhand comment, Trump inadvertently revealed a key difference between himself and Washington, though no one, friend or foe, is likely surprised. More importantly, he spotlighted the distance between merely temporal fame—essentially, name recognition in one’s lifetime—and the grail of posthumous recognition that motivates so many people in public life, as much now as in the Revolutionary era. Trump’s comment, while squiring Macron and his wife around Washington’s estate, no doubt reflected the truth of his experiences as a New York City real estate developer, reality-TV star and rookie presidential candidate who defied the odds—and all political norms—to win the office. In the worlds where Trump forged his reputation, few points were awarded for reticence. The opposite, however, can be true in posterity. In the long, considered judgment of history, selflessness is far more honored than self-aggrandizement. Washington was neither modest nor lacking in ego. He was, by some measures, the wealthiest American of his age, combining his inheritance with his wife’s fortune and an extremely lucrative series of land purchases that made him proportionally far wealthier than his 43rd successor. But few people today either know or care that he was so vastly rich. He’s entirely remembered for the qualities that made him an outstanding steward of a young and fragile nation: the good judgment and sense of propriety that led him to put the national interest ahead of his own. Washington understood that institutions outlive individuals. That may not seem like a radical notion, but it’s striking how unfamiliar it was in Washington’s day. Even more shocking was the idea that one could gain power and esteem by not coveting it. After leading the American Army to victory in the Revolutionary War, Washington made his first decision to retire to Mount Vernon, even though there were calls for him to be the monarch of the new nation. Eight years later, after the failure of the Articles of Confederation showed the need for a stronger central government, Washington answered the call to become the nation’s first president. After eight successful years, he heeded his own instinct to step down. He was entirely conscious of the statement he was making. He stayed in the temporary capital of Philadelphia to attend the inauguration of his elected successor, John Adams, and then made a point of walking behind Adams as the crowd of worthies dispersed from the podium: The office is more important than any man. The American tradition that even the most revered former officeholders must humbly stand behind their successors, recognizing that they are only guests in the house of power, is almost entirely the product of Washington’s exertions. So, too, are other traditions handed down from the Washington presidency, including the chief executive’s commitment to share power with Congress and the courts. It was one thing to sketch out such a system of government under the Constitution, but it didn’t become real until individuals—Washington foremost among them—actually chose to abide by those rules, creating a precedent we still follow today. These concepts are now so widely accepted that they seem inevitable, like the products of natural law. They are the pillars of the American system. And even in a presidency as committed to pushing boundaries as Trump’s, they are barriers he can’t cross. “If he does that, he will be the greatest man in the world,” the king supposedly replied. Indeed, at the tail end of the tour of Mount Vernon, a guide stationed in Washington’s study dutifully relates the story that he was the first person in all of history to assume so much power and then renounce it. So all these centuries of reverence, symbolized by the unending stream of visitors to Washington’s home, are the product of a decision not to call attention to himself. Two hundred and thirty years after Washington assumed the presidency, the nation is shaped by forces Washington couldn’t have imagined—not just technologies like television and social media, but a whole ethos that conflates fame and success, money and virtue, and which gave rise to a leader who literally engineered his own fame through sticking his name on every building, and every product, he could manage. It’s hard to imagine a more different sensibility than the one that guided the young Washington when, in 1761, he inherited the family plantation. He chose to keep the name his half-brother had given it—Mount Vernon, after Lawrence Washington’s former commanding officer. There is no evidence that he ever considered Trump’s suggestion that he name it after himself. To this day, the white mansion on a hill remains Mount Vernon, not Mount Washington. Wikipedia reveals there are currently no fewer than 15 Mount Washingtons in the United States.